This spring 2018 semester, the UH West Oʻahu University Chorus moves to a new 6:30 p.m. Thursday evening rehearsal time with a new director at the helm: Justin Kaʻupu. “I’m looking forward to making music with the UH West Oʻahu ‘ohana,” said Kaʻupu, who also is also a graduate of Kamehameha Schools Kapālama, and of the University of Hawaiʻi at Mānoa Music with a bachelor’s degree in Music Education. Kaʻupu also directs the Kapolei High School choirs. Highlights of this semester’s UH West Oʻahu University Chorus class (MUS 114) include performances at the E Hīmeni Kākou statewide collegiate choral festival on March 17, and at the Kapolei Choral Festival on April 20. The semester will kick off on Thursday, Jan. 11, at 6:30pm in C225 with a screening of well-known movie about singing groups and a pizza night for students. (There will be some singing, too). Kaʻupu, 34, was born and raised in Hilo and has been the director of choirs and in-house arranger at Kapolei High School since 2008. Under his direction the annual Kapolei Choral Festival of Hawaiian choral music has been running since 2011. 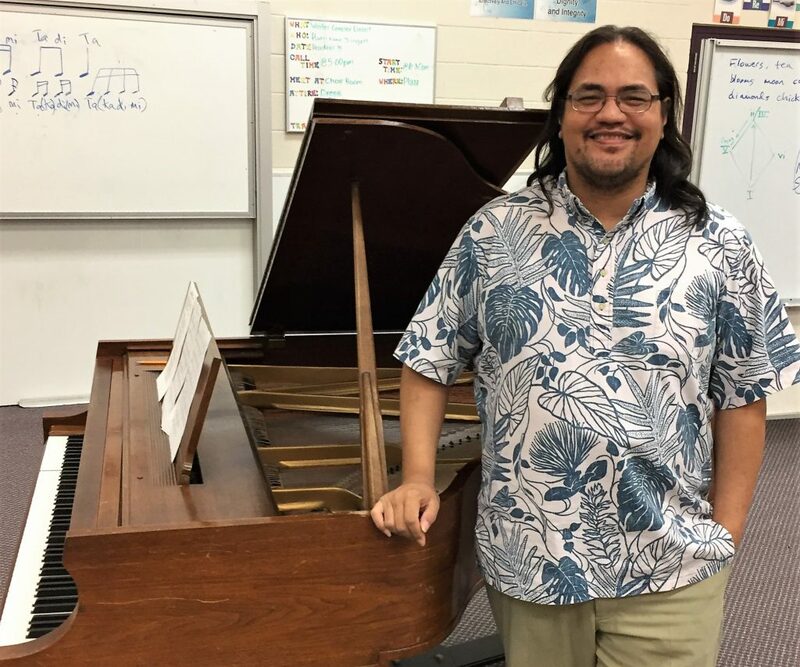 Kaʻupu also has been active in the Hawaiʻi chapter of the American Choral Directors Association and serves as co-chair for the Hawaiʻi All-State High School Choral Festival; he also has conducted various college ensembles including those at UH Mānoa, Ithaca College, and Hawaiʻi Pacific University. The Chorus is open to students, faculty, and community members, including high school students. For more information on joining the University Chorus, contact Prof. Magnussen at jonmagnu@hawaii.edu. Tagged Choral Director, Jon Magnussen, Justin Kaʻupu, MUS 114, music, University Chorus, University of Hawaii West Oahu. Bookmark the permalink.